Q1. Where is your resort? 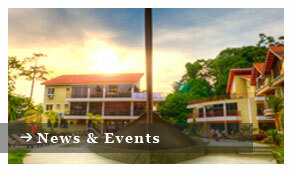 The Anjungan Beach Resort & Spa is located at Nipah Bay of Pangkor Island, in the Perak State of Malaysia. 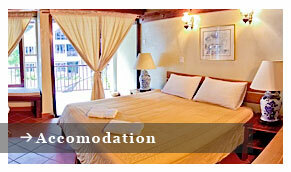 The resort is situated in between two of Pangkor Island’s best beaches, Nipah Bay and Coral Bay. Giam Island, a popular snorkeling location is situated only a few hundred meters from the beach in front of the resort. Q2. How far is the resort to Pangkor Island Jetty Terminal? The resort is about 10 km to Pangkor Island Ferry Terminal and about 10 minutes by taxi. The taxi fare is from RM 15 to RM 20 depending on the number of the passengers. The price varies from time to time. Q3. How far is the resort to the beach? The Nipah beach is just across the road from the resort and the Coral Beach (which is very popular) is only within 5 minutes walking distance. Q4. How far is Lumut bus station to Lumut Jetty? The bus station is only about 30 metres to Lumut Jetty Terminal. Q5. How far is your resort to Coral beach? 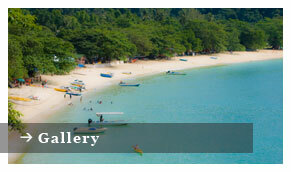 Coral Beach is only 50 meters from the resort or within 5 minutes walking distance. Q6. How can we get to your resort? The distance is about 200km with an approximately 3hours drive. On the highway E1 to the North from Kuala Lumpur to Ipoh, exit Bidor . From Bidor head to Teluk Intan for about an hour drive with a distance of approximately 60 km. From Teluk Intan take a road to Lumut or Marina Island via Lekir and Sitiawan, Manjung an hour drive with a distance of 60 km. On reaching Lumut you can choose to embark a ferry on 10 minutes ride from Marina Island or 40 minutes from Lumut ferry terminal. You can park your car at the public parking lot with a fee of between RM5 to RM10 per day at Marina Island or Lumut Parking Terminal. You can take a taxi at KLIA or LCCT direct to Lumut ferry terminal or Marina Island ferry terminal which is about 200 km with an estimated 3 hours ride. The price varies from RM 350 to 600 depending on the type of vehicle and the number of passengers. An executive 24 seater bus direct from the airport to Sitiawan. The bus ride is about 4 hours and the fare is only RM45 per person. For more bus information please visit www.starshuttle.com . From Sitiawan you need to take a taxi to Marina Island ferry terminal or Lumut ferry terminal, which is about 10km away and the taxi fare is about RM15 to 30 depending the type of vehicle and the number of passengers. If you are from Kuala Lumpur you can reach our place by Public Bus companies to Lumut such as Transnational, Plusliner, Arwana, Sri Maju, Konsortium etc which run from major bus stations in Kuala Lumpur, such as Pudu Raya, Jalan Duta, Bukit Jalil etc. The bus rides take about 4 hours (Express or Direct Bus Services) and for more bus information please refer to the buses website. If you are from the North such as from Penang, Langkawi you can reach our resort by road or bus from Alor Star, Butterworth and Ipoh to Lumut. For more bus information please visit the buses website. If you are a rider and love to ride, you can reach Lumut or Marina Island by the highway. The road is well maintained and you will enjoy the riding along the highway into the state road. For more information please refer on paragraph by ROAD. You have to embark the ferry at Lumut ferry terminal to Pangkor Island jetty terminal. The ferry ride takes about 45 minutes, stopping at Sungai Pinang Besar to disembark the local and then at Pangkor Island ferry terminal to disembark the rest and mostly the tourist. The return fare is currently RM 10 per person .Please keep the ticket for the return trip. You can choose to embark at Marina Island straight to Pangkor Island ferry terminal. The ferry ride is about 10 minutes and the return fare is the same RM 10.Please keep the ferry ticket for the return trip. From Pangkor jetty terminal, you can take a taxi van to the resort at the Telok Nipah (Nipah Bay).The taxi fare is from RM 15 to 20 depending on the number of passengers to a maximum of 10 people. Additional charge would be levy on the number of baggage. It is best to know and agree on the price first before boarding. Berjaya Air flies to Pangkor Island 3 times a week from Subang Airport in Kuala Lumpur. The flight time is about 45 minutes from Subang and the resort is only 1km from the air field. From the air field you can easily reach the resort by taxi. For more information please refer to Berjaya Air website (www.berjaya-air.com). Q7. What is your room rate? Q8. Do you offer discount? Unfortunately,no. Our rate is firm and fix as published on the website. Q9. Do you have a government rate or corporate rate? No, we do not have a government rate or corporate rate. We have only one rate for all guests. Q10. Can we pay for the room upon checking in? Yes, you can as a walk in guest depending upon availability, but we do not hold and guarantee the room. Q11. How much deposit you need in order to block the room. We need 50% deposit for normal and peak period; and 100% deposit during super peak period. Q12. Do you have a group package? Yes, we do, except during school holiday and super peak period. The group should be a minimum number of 50 persons. Q13. What happen if we lose the room key? If you lose the room key, RM100 is the surcharge for changing the whole new set of key as a security measure for the next guest. Q14. What type of room do you have? Q15. Do you have rooms with balcony? Yes we do. All our Deluxe 2, Deluxe 3 and Family 4 (Duplex) rooms are with balcony. Q16. Do you have sea view rooms? Yes we do. Our Special Deluxe rooms are facing the sea with bay view. Our Deluxe 2, Deluxe 3 and Family 4 room are pool view whereas our Standard Twin rooms are with garden view. Q17. Do you have room to cater for family more than four persons? Yes, and you have to notify us and book connecting rooms for 5 or 6 persons. Q18. What facilities do you have in your room? Bath with shower screen, hot water heater, toilet and wash basin, towel rack and vanity glass. Q19. Do you have a swimming pool? Yes, we have a small swimming pool, jacuzzi and wading pool for children. Q20. Do you have a spa? Yes but we stop operation due to poor demand. However we still provide massage service on request. Q21. Do you have an apartment? No. We do not have an apartment. Our resort is only room types. Each block has between 8 to 12 rooms. Q22. Do you have Wi-Fi facilities? Yes, we have Wi-Fi facilities from 9 am to 10 pm daily subject to weather condition. Q23. Do you have BBQ facilities? Yes, we have BBQ facilities. You have to book in advance at the rate of RM100 for usage and refundable RM 100 deposit for cleanliness and return of borrowed equipment. We will forfeit the deposit for lost of equipment and unclean pit. The rule of thumb is you must return in the same condition and manner as you receive. Thank you. Q24. Do you have a Karaoke Room? Yes, we have a room with a maximum of 20 people that can be used for karaoke. Due to the noise level, karaoke is not encourage and allowed till 12 midnight only. Q25. Do you have a seminar/ meeting room? Yes, we have an executive seminar and meeting room with a capacity to a maximum of 60 to 80 people depending on the type of arrangement. Q26. Where can we park our car or vehicle in Lumut? You can park your car at a covered parking lot in Lumut Town run by the local authority or at the private parking lot at Marina Island. Q27. Do you serve meals? Yes and no. We only serve ala carte breakfast and do not serve lunch and dinner .You can get lunch and dinner easily from nearby cafés and restaurants. However we do cater lunch, tea, dinner and bbq for group advance booking of 50 pax and above. Q28. What is the earliest and latest ferry schedule from Lumut to Pangkor Island? The earliest ferry to Pangkor Island from Lumut Jetty departs at 7 am and subsequently, at every 30 to 45 minutes interval .The last ferry leave at 8.30 pm. However, from Marina Island Jetty, the first ferry departs at 7.15 am and subsequently on every hour. The last ferry departs at 8.00 pm. Yes, your request will be looked into depending upon availability and situation. All requests are not automatically met or granted. Please reconfirm your request before checking in. Definitely we cannot entertain all requests! They are subject to availability and situation. Q30. Is your room inclusive of breakfast? No, the rate is for the room only. But we have ala carte breakfast. The price depends on what you order, ranging from RM3 to RM12. Q31. What type of breakfast do you serve? We serve American Breakfast, Continental breakfast, roti prata (canai), Nasi Lemak, various egg dishes, sandwiches, cereals and fresh fruits. Q32. Do you have laundry service? No. We do not have laundry service. However there are two places nearby that provide such services. One at Nipah bay Villa and the other at Sea Gull chalet. We have also professional laundry service in town known as Island Dhobi. Q33.What time is your reception and office hours? Our reception and office hour is from 8am to 5pm .However you can check in after 5 pm on request. Q34. What is your check in and check-out times? The check in time is after 2 pm and check out time is before or by 11 am. Q35. Do you allow late check out? Yes, depending on the availability of room. The surcharge of RM15 an hour after 11 am and full day rate check out after 4 pm. Q36. Do you have luggage storage facilities after check out? Yes, we have at a rate of RM10 per piece per day. Q37. Can we hire a vehicle on the island? Yes, you can. It is run by individual or an enterprise. They offer car rental of about RM100 to RM150, motorcycle between RM30 to RM60 and bicycle RM20 per day. The price is not fixed and varies according to season and demand. You need to contact them direct. Q38. Do you arrange transport from and to Kuala Lumpur airport? Yes, we do to assist our guest. But you need to confirm early, the date of arrival, flight number, name of guests and number in the groups. Payment for the transport needs to be paid in advance via credit card. Q39. What water sport activities do you have? We do not organize or run watersport or sport activities. However there are several individual or enterprise nearby manage sport activities such as fishing, snorkeling, island hopping, banana boats, jet ski, jungle trekking, kayaking, abseiling, repelling, beach volleyball, telematch and cycling. Q40. Do you allow additional person in your room? No, we do not allow additional person in our room. It is the resort policy that each guest must have their own bed. However we only allow one child under 5 years old, permitted by the parents to share the bed at no additional charge. Q41. What happen if we bring more than 1 child under 5 years old? If you bring more than 1 child under 5 years or more, we request you to book room accordingly for three or four or more to ensure the comfort of the guest on holiday. Q42. Can we bring more member than the number of guest registered in the booking form? No, you are required to follow strictly on the number of guest that you book in the booking form. Otherwise, you need to take additional room or the resort has the right to cancel your booking. Q43. How long do I need to book the room before check in? To be safe, you have to book at least two weeks earlier or 1 month before public holiday. Q44. How can we book a room at your resort? Q45. What happen if booking is done with invalid credit card? The onus is on you to ensure and book with a valid credit card and given correct card details. No room would be blocked or reserved or booked with invalid credit card. We will not be responsible if no room reservation being made at any time, if you book with invalid credit card. You are advised to check with your bank and card centre prior booking. Only booking with valid and honorable credit card would be processed. Please ensure the correct credit card information is given during booking. Q46. How much is the taxi fare to your resort? The taxi fare to the resort is RM15 for 2 persons and an additional charge for additional passenger to a maximum of ten in each taxi van. Q47. What are the major towns or destinations do the buses from Lumut go to? Q48. Do you have banks on the island? Q49. Do you have ATM machine on the island? Yes, ATM at each bank at Pangkor Town. Q50. Can we change foreign currency? Yes, you can change major foreign currency at the bank on the island. Q51. How is the weather at your resort? We have a tropical weather with 32° C to 35°C all year rounds. Sometimes we do have rain on and off. Certain months it rains quite often.